» Diatomaceous Earth For Fleas On Cats – Is It Really Any Good? Using diatomaceous earth is one way to ​ control fleas using a non chemical method of flea control​ for your cat. So far so good, no chemicals. It is going to take a little more effort on your part than just putting a flea collar on your cat or applying flea drops. However, this is a​ chemical free option for your cat which can also be used to get rid of fleas from around your home. Plus you can use it on the dog too. Note the little bit more effort part though. More about that in a minute. You may choose to use diatomaceous earth in conjunction with other ​natural methods of flea control​​. Good idea! In a hurry? Head straight to Recommendations (link ​below) for a quick summary of our ​recommendations. 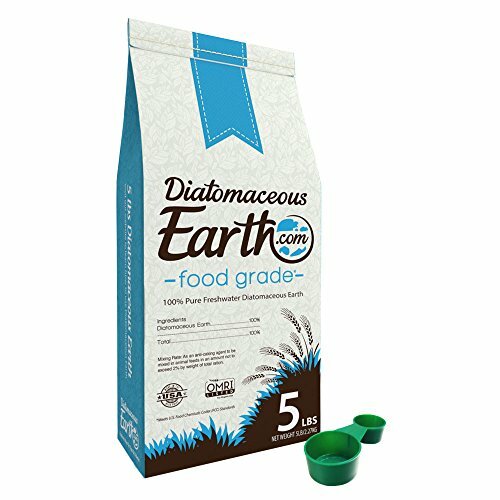 Should I Apply Diatomaceous Earth Directly On My Cat? How Is Diatomaceous Earth Used Around The house To Control Fleas? 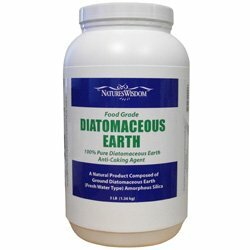 Diatomaceous earth is a naturally occurring, soft, siliceous sedimentary rock that is easily crumbled into a fine white to off-white powder. The powder can have an abrasive feel, similar to pumice powder. It looks like powder but is actually a mineral dust. ​This is Sarakiniko Cove on the island of Melos in Greece. The white mineral dust that looks like beach sand is Diatomaceous Earth. 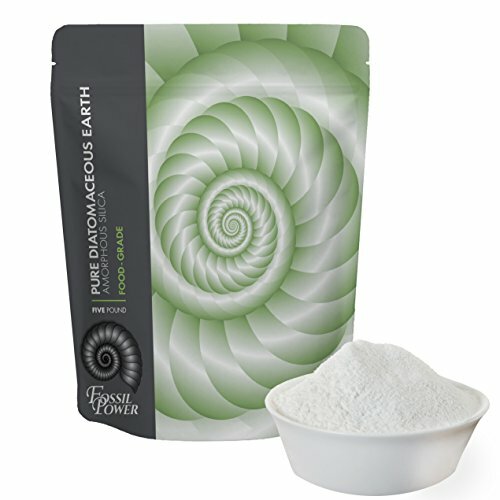 Diatomaceous Earth is usually purchased in resealable bags or large screw top plastic containers. This video shows how to apply diatomaceous earth to your cat. Does Diatomaceous Earth Work For Killing Fleas? It does work, bear in mind that you will need to be vigilant about treating areas ​around the home plus places like the scratching post and other places the cat likes to ​hang out. ​All of the products reviewed here are 100% food grade. This is what you ​must use if you are using it for treating fleas on your cat. Diatomaceous earth that is not food grade is a very effective insecticide however as this article is specifically about cats, only 100% food grade products will be reviewed. 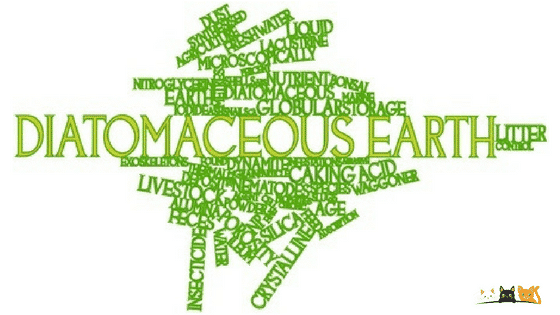 Where Do You Get Diatomaceous Earth? Buying ﻿﻿﻿diatomaceous earth online is convenient because the larger bags are pretty heavy and you can avoid the heavy lifting to and from the store by having it delivered. ​Once you have the bag at home the product can be decanted into smaller more manageable containers. Always look for the Food Grade label. This is a ​4lb bag. It has no additives and as a bonus includes the powder duster which is actually in the bag with the diatomaceous earth. The duster may settle near the bottom of the bag. The duster is handy when applying diatomaceous earth directly to the cat and also for puffing the dust into small spaces. As a precautionary measure use a mask when using large quantities of the product as it can be dusty. This advice applies to any diatomaceous earth product. Avoid using diatomaceous earth on windy days. Harris donates 10% of its profits to the Etowah Valley Humane Society, a non profit organization that saves thousands of animal lives each year. This product is OMRI listed which means that ​it has been reviewed against organic standards. This product ​is available in a 12 lb, 2 lb and 5 lb bag. The link goes to a 5 lb bag so if you need a different size remember to change the size of the bag. There are no additives or chemicals in this product. Dust onto your cat's fur. Using a spreader or applicator makes the application much easier. Think powder and you will have the general idea. You may have something else at home such as a squeezy plastic bottle ​that could be used as a dust applicator. ​This product is listed by OMRI ​and has been reviewed against organic product standards. It has no additives or contaminants and is packaged using stainless steel machinery. Sprinkle in infested area and in nooks and crannies. Treat the cat , following the directions in the video. The insect needs to crawl over the powder for it to work effectively. This is the reason ​sprinkling the powder on cat bedding, carpeted cat trees and so on is recommended. 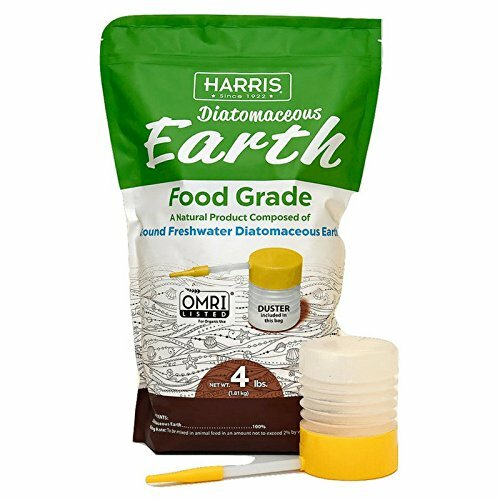 This product is 100% diatomaceous earth and is food grade. Nature’s Wisdom say that this product is sourced from a food grade deposit that has pure water. The diatoms (that make up diatomaceous earth ) are harder from pure water supplies than ones found where the water supply is salt water. Diatomaceous Earth treats many other types of troublesome bugs, plus bed bugs in addition to fleas. As mentioned earlier, this is a fine powder so be sure to empty the filter of the vacuum cleaner regularly when using this product as the fine powder may clog the filter. ​This product is in a plastic container as pictured. The product also comes in a plastic bag so there are refill options or you may prefer to buy in a plastic bag and recant into your own container. The spreader by Harris is specifically for diatomaceous earth. 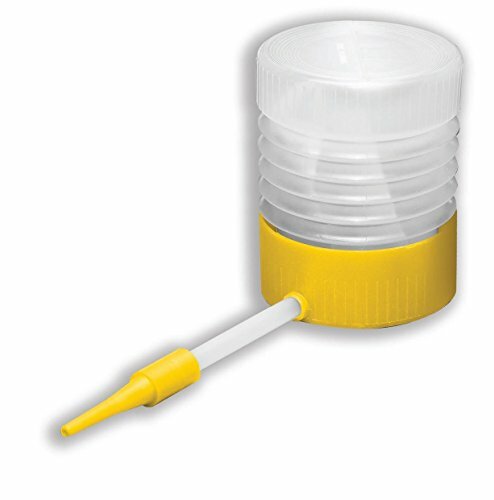 This applicator is included with some of the Harris products like the one shown on this page. This handy little product makes spreading diatomaceous earth so much easier. ​Simply twist the top, fill with powder and it is ready to use. Apply gentle pressure when squeezing and the product will puff out. The long nozzle means that you can get into all those tricky spots that are difficult to reach. The powder will go where you want it to go ​with this product. If it starts to clump just turn upside down and give a little shake. Depending on the amount of pressure you give when squeezed will affect the amount of powder coming out. Experiment with different pressure to get it just right for your needs. ​In addition to using diatomaceous earth on your cat to control fleas you can also use diatomaceous earth in your home to get rid of fleas. Sprinkle the dust lightly in all the places your kitty likes to hang out and don’t forget all the nooks and crannies. When applying the dust to tight spaces, an applicator is a good idea and will ensure you don't sprinkle more dust than you need. Be mindful of the fact thatdiatomaceous earth can be hard on a domestic vacuum cleaner so be sure to check the filter and vacuum small areas at a time. It is non toxic to humans (using the food grade diatomaceous earth ) however it is still a dust and it is advisable to just take a normal amount of care to ensure that you are not breathing in volumes of the dust. Harris is a trusted company that makes an absolutely top quality product and is ​our first product of choice. The included applicator ​​makes this product an excellent ​purchase. It is a food grade​ product. Harris also donates part proceeds from profits to a non profit animal rescue organizations. A plastic tub as used in ​​Nature's Wisdom is ​convenient for ease of handling, as opposed to a softer sided bag. It is also available for purchase in plastic bags as are other food grade diatomaceous earth products. ​Future product purchase​d in a plastic bag can be decanted into the plastic container ensuring that the container is reused. ​There are more ideas here that incorporate natural methods of flea control​. ​Whether you choose a chemical option or natural ​option is your choice. It is our job to give you the information to make an informed choice.